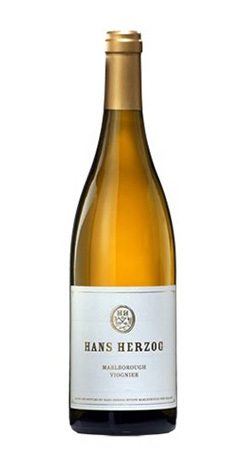 Complex and powerful with a honeyed, slightly nutty edge and rounded peach and apricot notes. Lovely intensity with good acidity and balance. This Viognier is the Hans Herzog flagship. An expressive wine with aromas of elderflower, fresh apricots, and other exotic stonefruits complemented perfectly by hints of honey and spiced undertones. A refreshing wine of significant weight and texture well balanced by good acidity providing a wonderfully long finish. Picked at a tiny low yield of only 500g per vine due to a cool Spring. It has retained the deep yellow colour of the ripe grapes and offers a heady wine with rich aromas and flavours of apricot, peach and tropical flowers. Gentle grape pressing was followed by a natural yeast fermentation in French oak puncheons (500lt). Half of the young wine went through a secondary fermentation with its lees regularly stirred. Aged for 18 months in the same barrels before bottling. Hans Herzog Estate is one of New Zealand’s most treasured, truly artisan wineries, and Hans Herzog one of its most respected winemakers with more than 40 vintages of winegrowing under his belt. Settled in 1994 in the heart of Marlborough within the most beautiful Mediterranean gardens, Herzog’s offers casual luxury and indulgence for wine and food lovers.